Let’s face it, developers and programmers love their hoodies. 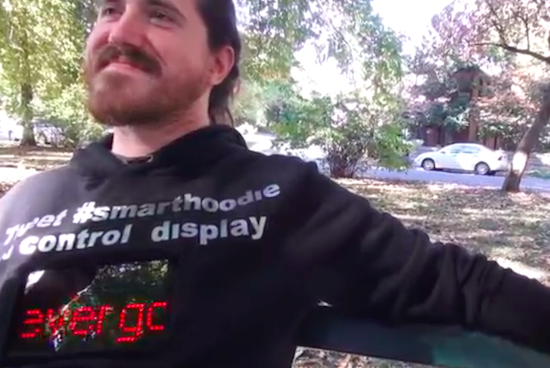 That’s why last fall, a few members of the FirstBuild team built a connected sweatshirt capable of displaying text and tweets with a specific hashtag. The hoodie is equipped with a Blend Micro board and a 16 x 32 LED matrix panel with a plastic overlay that’s sewn into a cutout on the front of the shirt. The system connects with a smartphone over Bluetooth to reveal the message, though in the future its creators hope to add animated GIFs. Power is supplied through a USB battery placed inside a wearer’s pants or the hoodie’s pocket, in which case a USB cable can simply run from the Blend Micro. Ready to turn some heads as you walk down the street? You can check out FirstBuild’s entire project step-by-step here.